Because operations management is not industry specific, careers in operations management span most industries. In addition to the traditional manufacturing companies, you can also consider careers in such service industries such as airlines, banking, financial services, railroads, hospitals, restaurants, hotels, non-profit organizations, and in government. ISU’s Career Center can help you explore opportunities. 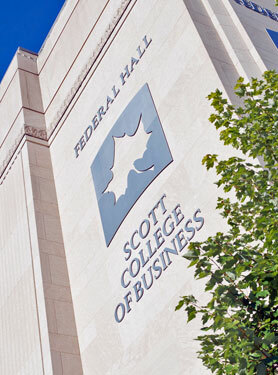 You can also visit the Scott College of Business' Meis Student Development Center for more information about internships and careers in operations management and analysis. If you decide to major in Operations and Supply Chain Management, your career may begin in a position such as Production Planner, Supply Chain Manager, Procurement or Forecasting Manager, Project Manager, Lean Coordinator, Director of Inventory Control, Retail Services Manager, Warehouse Manager, Quality Manager, and Materials Manager, just to name a few. In time, you may work your up to such positions as Director of Operations, Vice President of Operations, Director of Quality, or Vice President of Supply Chain Management. Connexus Indiana has been formed by the Central Indiana Corporate Partnership to promote career opportunities in advanced manufacturing and supply chain/logistics in Indiana, closely related to the operations management and analysis program.